It's a huge, crazy and confusing Internet out there. If you are a new poker player looking to start playing poker and are looking for a poker site, it could be doubly confusing. I mean, what kind of site do you want to play at? Should you join one of the top poker only sites, or should you join a sportsbook with a high quality poker room? The first thing you should realize is that not all sportsbooks offer a poker room. While it was more popular a few years ago, many sportsbooks like WagerWeb have decided not to offer poker to their players even though it is very profitable. However, there are still many sportsbooks that do offer poker. The obvious advantage to playing poker at a sportsbooks is that you can also bet on sports. If you are a client of The Gaming Pub but also enjoys playing a game of Texas Holdױem, then you definitely want to consider a sportsbooks. But sports betting isn't the only reason you might want to open a sportsbook account. The competition at a sportsbook's poker room is usually of a lower skill in compared to dedicated poker room sites like PokerStars. After all, these are people who also like to bet sports and do not concentrate only on the game of poker. Most of the time, sports betting is their primary gambling activity and many sports bettor love to gamble and have a lot of action. What usually ends up happening is that a bettor wins big on a couple big sports bets and decides to sit down at a poker table. Because they don't really play poker regularly, some sports bettors are obvious donkeys at the poker table and easily lose their money to the better players at the tables. While this sounds like an argument for playing at a sportsbooks, it isn't completely. These same players playing weak hands out of position can also be frustrating when they continuously get lucky and draw out on you. If you aren't disciplined, you could end up going on tilt. We already established that the play at a sportsbook is often of less quality. But you shouldn't be scared at playing better quality opponents at a dedicated poker site like Full Tilt Poker or PokerStars. The players at a poker site like Poker Stars are there for one thing and one reason only - Poker. Sure these sites have their fair share of donkeys, but on the most part these sites offer the better knowledgeable competition. This means players not only play within their ability, they sit at the appropriate tables for their bankroll and risk comfort. 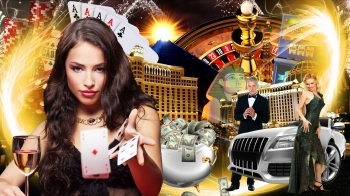 This usually provides a better experience and also allows a new poker player to learn from other true poker players. Now, that you know the reasons and advantages of joining a dedicated poker room or joining a sportsbook, the decision is up to you. Register, play, have fun and win!